The 3M 7800 Ultimate Reuseable Full Facepiece respirator features a durable elastomeric facepiece and is designed for a wide range of applications. 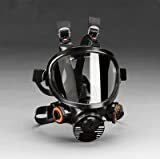 The full facepiece is made of silicone and features a double-flap face seal and size easy-adjusting straps. The face piece is soft and pliable with a scratch-resistance lens. The extra-large inhalation and exhalation valves makes breathing easier. The 7800 series respirator is designed for versatility, comfort and long life. Its available in three sizes, ensuring a proper fit for almost any size face. The 3M 7800 Series respirators can be used with any 3M respirator filters and 3M respirator cartridges. Check out the rest of our 3M Respirators.